Black Clover (Japanese: ブラッククローバー, Hepburn: Burakku Kurōbā) is a Japanese manga series written and illustrated by Yūki Tabata. It has been serialized in Shueisha's Weekly Shōnen Jump magazine since February 16, 2015, and has been collected into 20 tankōbon volumes. The story centers around Asta, a young boy seemingly born without any magic power, something that is unknown in the world he lives in. With his fellow mages from the Black Bulls, Asta plans to become the next Wizard King. The manga has been adapted into an original video animation produced by Xebec, which was released in 2017, as well an anime television series produced by Pierrot, which also premiered in Japan in 2017. The manga series was licensed for an English language release in North America by Viz Media, while the anime series is licensed by Crunchyroll and Funimation. The series focuses on Asta, a young orphan who was raised from birth after being abandoned at a church orphanage on the outskirts of the Clover Kingdom along with his fellow orphan, Yuno. While everyone is born with the ability to utilize Mana in the form of Magical Power (魔力, Maryoku), Asta is the only exception as he compensates through physical training. Conversely, Yuno was born as a prodigy with immense magical power and the talent to control wind magic. Motivated by a desire to become the next Wizard King, an authority figure second to the king of Clover Kingdom, the two youths developed a friendly rivalry, acquired grimoires with Yuno obtaining a four-leaf grimoire held by the kingdom's first Wizard King. Asta, despite his lack of magic, obtained the mysterious five-leaf grimoire, which contains the rare and mysterious Anti-Magic. But after he and Yuno each joined a Magic Knight squad as the first step to fulfill their ambitions, Asta finds himself facing a terrorist organization that is gathering magic stones to conduct a ritual to destroy the Clover Kingdom for its actions against the original inhabitants at the time of the first Wizard King. Written and illustrated by Yūki Tabata, Black Clover has been serialized in Shueisha's manga anthology Weekly Shōnen Jump since February 16, 2015. The manga is Tabata's second series in Weekly Shōnen Jump: his first series, Hungry Joker (ハングリー ジョーカー, Hangurī Jōkā), was launched in the magazine on November 12, 2012, where it ran for 24 chapters before being cancelled in 2013. The chapters have been collected into tankōbon volumes by Shueisha since June 4, 2015. In total, there are 194 chapters and 20 tankōbon volumes. On February 9, 2015, Viz Media announced that they would publish the first three chapters of the series in their Weekly Shonen Jump digital magazine as part of their "Jump Start" program in North America. On March 30, 2015, they announced that the series would join their weekly lineup, beginning with chapter 4 on April 6, and publishing at an accelerated rate until the chapters were current with Japan. Plans to release the series in print were announced in during their panel at New York Comic Con on October 9, 2015. On February 2, 2018, a gag manga spinoff illustrated by Setta Kobayashi titled Asta's Journey to Wizard King (アスタくん魔法帝への道, Asta-kun Mahōtei e no Michi) launched in Shueisha's Saikyō Jump. On September 30, 2018, a manga based on the video game Black Clover: Quartet Knights launched on October 7, 2018. An original video animation produced by Xebec that is based on the series was shown at the 2016 Jump Festa between November 27 and December 18, 2016. It was bundled with the 11th volume of the manga, which was released on May 2, 2017. A second original video animation was shown at the 2018 Jump Festa. At the Black Clover Jump Festa event on December 18, 2016, an anime television series adaptation by Pierrot was announced. It is directed by Tatsuya Yoshihara, with Kazuyuki Fudeyasu writing scripts, Itsuko Takeda doing character designs, and Minako Seki composing the music. The first season aired from October 3, 2017 to September 25, 2018. The first season was initially listed as running for 13 episodes, but was later expanded to 51 episodes. On September 3, 2018, Crunchyroll announced that a second season will continue on October 2, 2018. The second season will run for 51 episodes. Crunchyroll is simulcasting the series, while Funimation is producing an English dub as it airs. Adult Swim's Toonami block premiered the English dub on December 2, 2017. Sony Pictures UK and Funimation released the first part of the series on home video in the United Kingdom and Ireland, with subsequent parts released by Manga Entertainment. Universal Sony classified the first part of the series for release in Australia and New Zealand, on behalf of Funimation, with Madman Entertainment releasing subsequent parts. At Jump Festa 2017, a video game, titled Black Clover: Quartet Knights, was announced for a 2018 release on PlayStation 4 and PC. It was released in Japan on September 13, 2018, while the western release on September 14, 2018. A mobile game called Black Clover: Dream Knights (ブラッククローバー 夢幻の騎士団, Burakku Kurōbā: Mugen no Kishidan) has been announced. It was released in Japan on November 14, 2018. Asta is featured as a playable character in the Weekly Shōnen Jump crossover game Jump Force. Volume 1 reached 23rd place on the weekly Oricon manga charts, with 38,128 copies sold; volume 2 reached 17th place, with 61,918 copies; volume 3 also reached 17th place, with 80,462 copies; volume 4 reached 13th place, with 93,866 copies; volume 5 reached 15th place, with 108,503 copies; and volume 6 reached 11th place, with 118,783 copies. As of January 2019, the manga has 7 million copies in print. Reviewing the series for ComicsAlliance, Tom Speelman described the premise as "what if Harry Potter was a knight and also kinda dumb?" He recommended it for fans of Naruto and Fairy Tail, noting its similarities to the former series as well as to Bleach. He praised the author's ability to invigorate stock characters. Henry Ma of Ka Leo O Hawaii praised the series' humor and art, noting that the latter was "very nice" and was similar to Fairy Tail. However, not all critics were positive, with a board of comic book writers at San Diego Comic-Con listing the manga as one of the worst from 2016. ^ "Official Website for Black Clover". Viz Media. Retrieved October 27, 2017. ^ a b "Black Clover Anime Reveals October 3 Premiere, More Golden Dawn Cast Members". Anime News Network. August 24, 2017. ^ "Shonen Jump to Launch 4 Manga, Including Detective Story by Psyren's Iwashiro". Anime News Network. January 29, 2015. Retrieved June 10, 2016. ^ a b Speelman, Tom (March 17, 2016). "Big Spells, Bigger Swords: Should You Be Reading 'Black Clover'?". ComicsAlliance. Archived from the original on June 16, 2016. Retrieved June 10, 2016. ^ "Shonen Jump to Launch 3 New Manga Series in November". Anime News Network. October 21, 2012. Retrieved June 10, 2016. 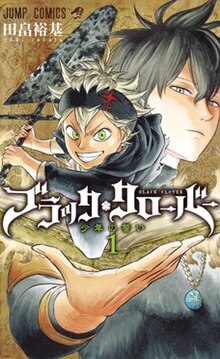 ^ ブラッククローバー 1 [Black Clover 1]. Shueisha (in Japanese). Retrieved February 6, 2019. ^ ブラッククローバー 20 [Black Clover 20]. Shueisha (in Japanese). Retrieved April 3, 2019. ^ "Viz's Shonen Jump to Add Yūki Tabata's Black Clover Fantasy Manga (Update)". Anime News Network. February 9, 2015. Retrieved June 10, 2016. ^ "Viz's Shonen Jump Adds Yūki Tabata's Black Clover Fantasy Manga to Regular Line-Up". Anime News Network. March 30, 2015. Retrieved June 10, 2016. ^ Green, Scott (March 31, 2015). ""Black Clover" to Join English "Shonen Jump"". Crunchyroll. Retrieved June 11, 2016. ^ "Viz Media Adds Kuroko's Basketball, Haikyu! !, Yona of the Dawn Manga". Anime News Network. October 9, 2015. Retrieved June 10, 2016. ^ "Black Clover Gets Gag Manga Spinoff". Anime News Network. January 27, 2018. Retrieved January 27, 2018. ^ "Black Clover: Quartet Knights Game Gets Manga Adaptation". Anime News Network. September 30, 2018. Retrieved September 30, 2018. ^ Green, Scott (August 24, 2016). ""Black Clover" Anime Episode To Screen At Jump Festa". Crunchyroll. Retrieved August 24, 2016. ^ "Jump Special Anime Festa Event Confirms Screening of Black Clover Anime". Anime News Network. August 29, 2016. Retrieved August 29, 2016. ^ "XEBEC Animates Black Clover Manga's Event Anime". Anime News Network. October 6, 2016. Retrieved October 6, 2016. ^ a b "Yūki Tabata's Black Clover Manga Gets TV Anime by Studio Pierrot (Updated)". Anime News Network. December 18, 2016. Retrieved December 18, 2016. ^ "Crunchyroll Streams Black Clover Event Anime From Jump Special Anime Festa". Anime News Network. December 2, 2018. Retrieved December 2, 2018. ^ "Monster Musume's Tatsuya Yoshihara Directs Black Clover TV Anime". Anime News Network. June 1, 2017. Retrieved June 1, 2017. ^ "Black Clover TV Anime Premieres This Year". Anime News Network. July 8, 2017. Retrieved July 8, 2017. ^ "Funimation Lists 13 Episodes For "Black Clover" Anime". Crunchyroll. September 17, 2017. Retrieved September 17, 2017. ^ "Black Clover Anime Listed With 51 Episodes, 4 Openings & Endings". Anime News Network. November 6, 2017. Retrieved November 7, 2017. ^ "Black Clover Anime to Continue Beyond Episode 51". Anime News Network. September 3, 2018. Retrieved September 3, 2018. ^ "Black Clover Anime Unveils Visual for New Season". Anime News Network. September 21, 2018. Retrieved September 22, 2018. ^ "'Black Clover' Revises Initial Episode Order". Comicbook. February 12, 2019. Retrieved February 13, 2019. ^ "Crunchyroll to Stream Black Clover Anime Series Starting in October". Anime News Network. July 15, 2017. Retrieved July 15, 2017. ^ "Funimation to Simuldub Black Clover Anime This Fall". Anime News Network. September 1, 2017. Retrieved September 1, 2017. ^ "Funimation Reveals Black Clover English Dub Cast, October 29 Premiere". Anime News Network. October 26, 2017. Retrieved March 3, 2018. ^ "Toonami to Air Black Clover Anime Starting December 2". Anime News Network. November 17, 2017. Retrieved November 17, 2017. ^ "Sony Pictures UK to release Black Clover anime series for home video release!". Anime UK News. June 19, 2018. Retrieved June 21, 2018. ^ Stevens, Josh A. (February 15, 2019). "Manga UK's Spring Slate Adds DARLING in the FRANXX, Black Clover & More!". Anime UK News. Retrieved February 15, 2019. ^ "BLACK CLOVER SEASON 1 PART 1". Australian Classification Board. Retrieved August 14, 2018. ^ "Black Clover Season 1 Part 2 DVD / Blu-Ray Combo". Madman Entertainment. Retrieved January 1, 2019. ^ "Black Clover: Quartet Knights trailer brings 4-on-4 anime warfare". Destructoid. December 18, 2017. Retrieved December 18, 2017. ^ "Black Clover Quartet Knights Game Launches in Japan on September 13". Anime News Network. May 27, 2018. Retrieved May 27, 2018. ^ "Black Clover: Quartet Knights Game Heads West on September 14". Anime News Network. May 29, 2018. Retrieved May 29, 2018. ^ "Black Clover Manga Gets Smartphone Game this Year". Anime News Network. April 22, 2018. Retrieved April 22, 2018. ^ "Black Clover: Mugen no Kishidan Smartphone Game Launches in Japan". Anime News Network. November 15, 2018. Retrieved November 15, 2018. ^ Hodgkins, Crystalyn (December 14, 2018). "Black Clover's Asta Joins Jump Force Game's Lineup". Anime News Network. Retrieved December 15, 2018. ^ "Japanese Comic Ranking, June 1–7". Anime News Network. June 10, 2015. Retrieved June 11, 2016. ^ "Japanese Comic Ranking, August 3–9". Anime News Network. August 12, 2015. Retrieved June 11, 2016. ^ "Japanese Comic Ranking, September 28-October 4". Anime News Network. October 7, 2015. Retrieved June 11, 2016. ^ "Japanese Comic Ranking, October 5–11". Anime News Network. October 14, 2015. Retrieved June 11, 2016. ^ "Japanese Comic Ranking, November 30-December 6". Anime News Network. December 9, 2015. Retrieved June 11, 2016. ^ "Japanese Comic Ranking, December 7–13". Anime News Network. December 16, 2015. Retrieved June 11, 2016. ^ "Japanese Comic Ranking, February 29-March 6". Anime News Network. March 9, 2016. Retrieved June 11, 2016. ^ "Japanese Comic Ranking, March 7–13". Anime News Network. March 16, 2016. Retrieved June 11, 2016. ^ "Japanese Comic Ranking, May 2–8". Anime News Network. May 11, 2016. Retrieved June 11, 2016. ^ "Japanese Comic Ranking, May 9–15". Anime News Network. May 18, 2016. Retrieved June 11, 2016. ^ "Roundup of Newly Revealed Print Counts for Manga, Light Novel Series - January 2019". Anime News Network. February 2, 2019. Retrieved February 2, 2019. ^ Ma, Henry (April 20, 2015). "Manga Mondays: 'Black Clover' special review". Ka Leo O Hawaii. Retrieved June 11, 2016. ^ Ellard, Amanda (July 25, 2017). "Best and Worst Manga of 2016 Results - Comic-Con International". Anime News Network. Retrieved October 29, 2017. This page was last edited on 16 April 2019, at 22:08 (UTC).